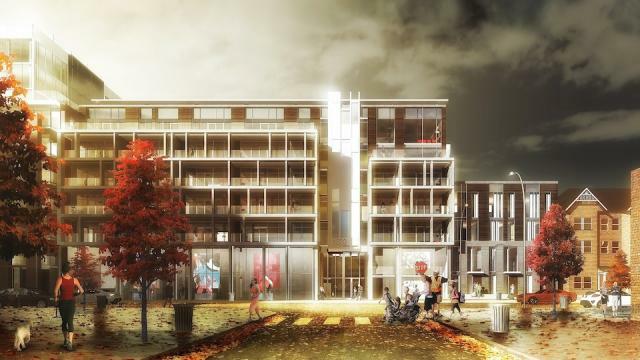 Streetcar Developments is developing The Taylor Lofts in Leslieville, located at 1220 Dundas St E (Dundas and Carlaw). The Taylor will be a 7 storey boutique loft building offering only 96 units, ranging from modern 1 bedroom lofts to spacious 4 storey urban towns. Leslieville is one of Toronto’s hottest loft neighbourhoods. Unpretentious, creative, diverse, entrepreneurial, close to everything that matters and brimming with independent spirit. Features include engineered wood flooring throughout, 9′ exposed concrete ceilings, single sliding glass door to balcony or terrace, quartz kitchen countertops, porcelain tile backsplash, under-mounted sinks, and walk-in closets. VIP agent sales are now underway, with attractive buyer incentives offered by the builder.